The “UTRGV School of Art juried Exhibition” on display at the Kika de la Garza Art Center is a continuation of the Artists Unanimous student art organization. In an open-call to the school of art, 30 students responded with works. Of these, only a few were juried out by jurors, South Texas College art faculty members David Freeman and Chris Leonard. They selected works and chose the award winners. 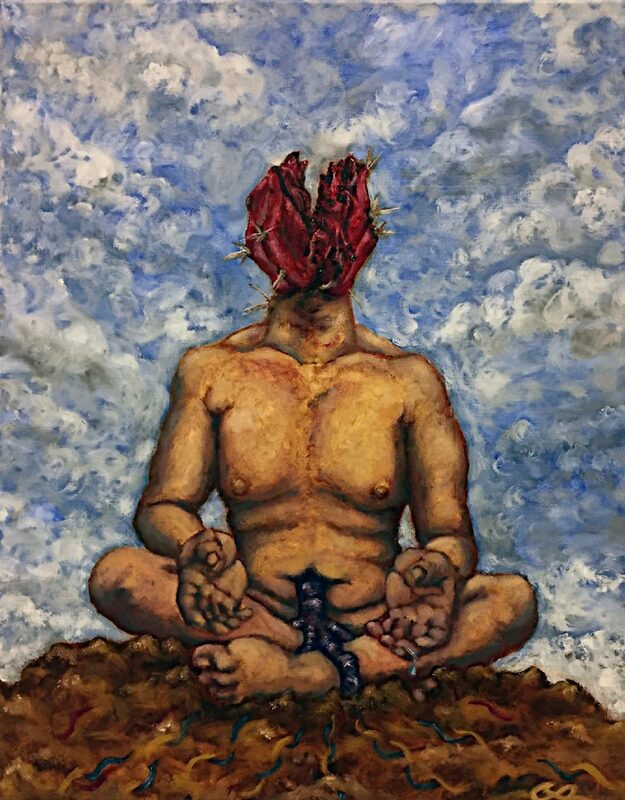 The Best of Show award went to Ricardo Partida for his oil painting, “Death of a Fertile Male.” First place went to Jonathon Hernandez’s print, “McWhata,” with second place going to “Respiration,” an oil painting by Cristobal Rodriguez. Third place went to “Eternal Summer,” a mixed media work by Jessica Garza, and an honorable mention was given to the acrylic painting, “Puerto Rico Se Levanta,” by Tatiana Diaz. Overall, this is a good exhibition. 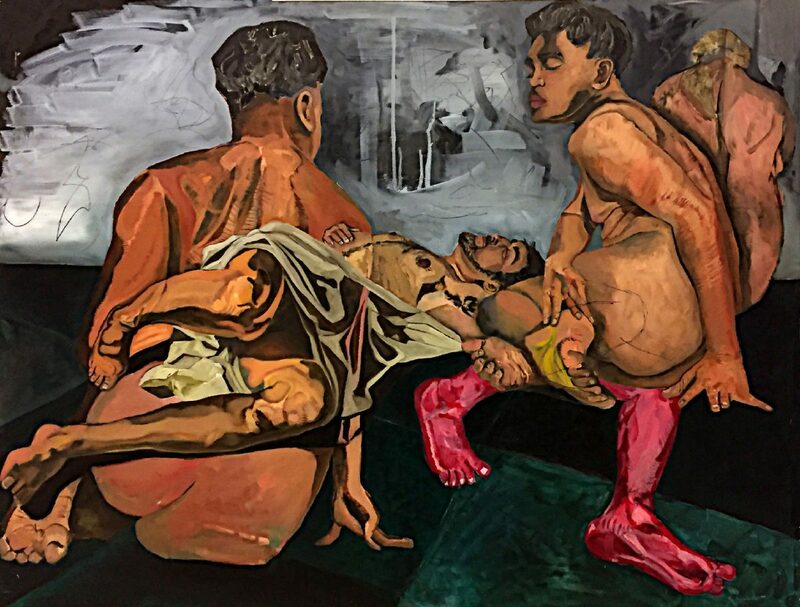 Jonathon Hernandez, the organization’s president, pointed out the strength of the human figure in this exhibition, and figurative art is certainly the dominate direction here. A pair of photographs by Maximilian Cervantes, “Mother” and “Father,” are outstanding, rising above the rest of the show through the imagination and sensitive visualization needed to produce powerful images. Cervantes gives us works with a multi-level emotional presence, as opposed to the single-observation image. 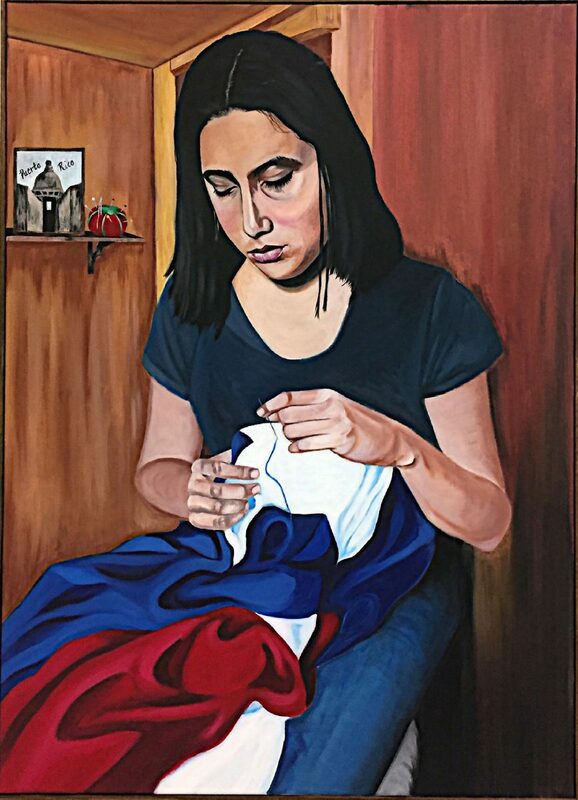 "Puerto Rico Se Levanta" by Tatiana Diaz. 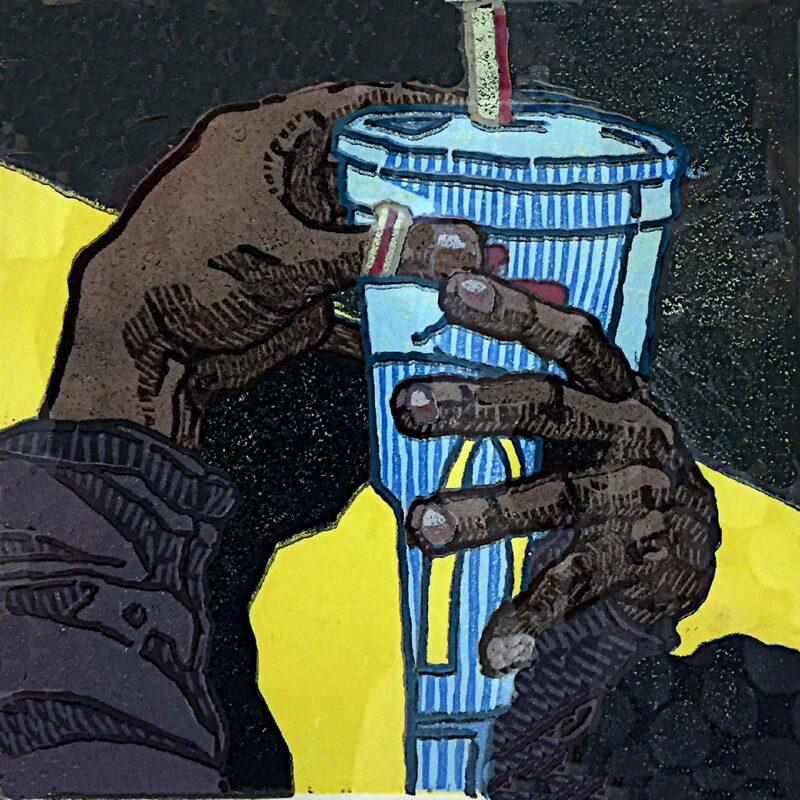 "McWhata" by Jonathon M. Hernandez. 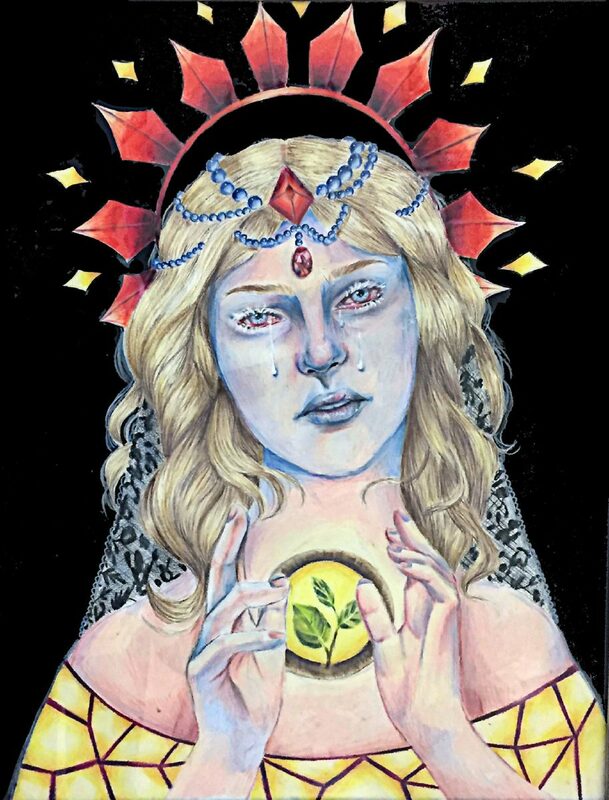 "Eternal Summer" by Jessica Garza. "Death of a Fertile Male" by Ricardo Partida. While the initial impression of the exhibition seems meager — only a few large paintings and no viable 3-D works — smaller pieces offer plenty of ideas to spark interest, particularly in the printmaking section. The aesthetic maturity observed in these works ranges from a little to a lot, since the open-call concept allowed a range that encompasses freshman to graduate level students. Students in this exhibition have conquered the skill and technique necessary for a polished product and produced a good show. 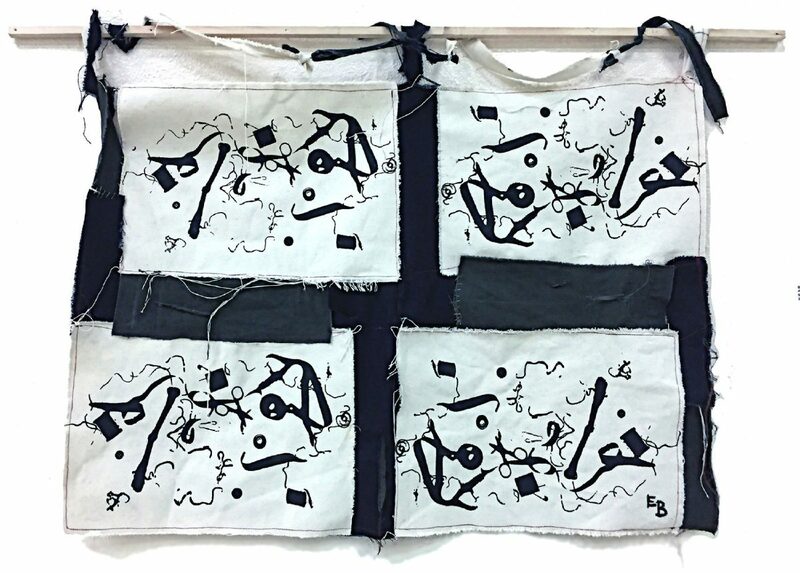 The screen-print, “Patch Me Up, Baby,” by Erica Briones makes a jump beyond traditional printmaking into a broader concept. Organizational or Institutional exhibitions, such as this one, tell us more about the group than the individual artists. Solo exhibitions let the individual artist speak; group exhibitions tell us about the common thread that brings the artists together. There is always an aesthetic pivot to consider. Farris suggested that the student turnout during the last few years for Artists Unanimous exhibits has been low because of administrative adjustments at the new university and the student art group’s internal politics. “So, the participation was good compared to last year,” Farris said, “and I believe this exhibit fairly reflects the aesthetics of the school of art. These Artist Unanimous exhibitions have become regular art fare, and fortunately, Hernandez has stepped up to run the organization along with five students to keep these shows going, at least for another three years. Farris and Jerry Lyles both serve as faculty advisors for the group.